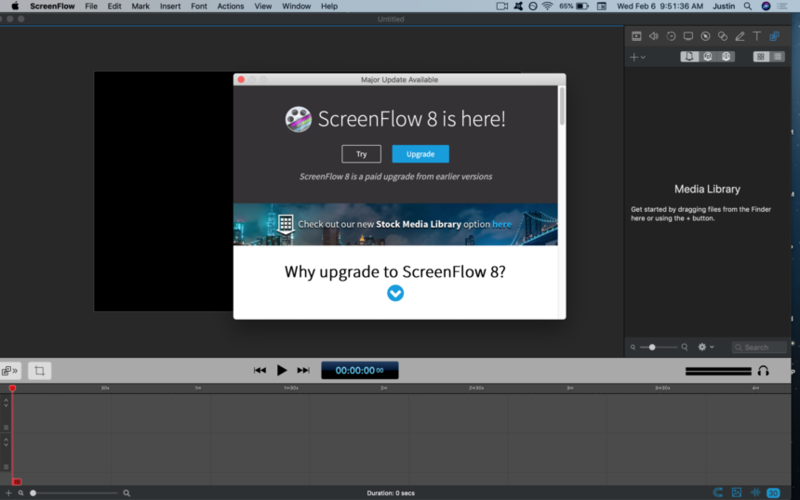 Hey, longtime screenflow user and I just upgraded to version 7. I capture, then export separate video and audio sources to edit in another program. Something that has always slowed me down is the lack of keyboard shortcuts in the app, apparently still a problem in version 7. My request - let us assign a button to mute or unmute the selected audio clips. 'M' by default would be awesome! Compromise - If you don't want to put it in the shortcut list then please put it in the Edit menu and I will make my own shortcut through system preferences. That would be useful. Please do fill out the Feature Request Form and we'll send you a case number and we'll look at the idea. Justin Wunderlich while I'd still like this function on the keyboard as an editing function, the mute button on the left of the timeline has significantly decreased the amount of clicking I've had to do when exporting. Good point! I had forgotten about that because I usually keep my tracks at the smallest size and that option disappears. But yeah I need a mute shortcut for editing purposes. Please fill out the previously posted feature request form so the developers are aware of interest. a fairly satisfactory solution has been found using style presets. To mute, select a clip, check mute, click the box icon beside +action, save it and assign a shortcut to it. Problem - no way to unmute or make it a toggle because anything in the default position won't be saved by style presets. Additionally I found that CMD-2 will open the inspector to the audio tab which saves some repetitive eye and mouse movement. Jon Tidey Thanks for posting the workaround. Justin Wunderlich Make sure you fill out the form as well as the number of request may impact development decisions. Justin Wunderlich Most programs require paid upgrades. That's separate from free updates. Once a new version (upgrade) comes out, that's where our development team focuses resources. Upgrades are usually feature improvement focused. That's the case with most developers. Some improvements may be made within the same version but some features take time and resources. The cost of doing business. If you have Premium support there's 25% off on upgrades. CraigS Oh I'm sure there is, but I don't agree with paying a premium cost to potentially save 10$ on a future product, because typically you end up spending more in total. As for the upgrades vs updates... Maybe. But I know my audio editing program, a $200 program, has not charged me for any updates/upgrades at all. They also don't make their older versions OBSOLETE on newer mac os software versions so then I'm Forced to buy into their upgrade. Which is shady practice in my opinion. One day I wanted to upgrade my mac operating system, not spend another 40$ on a program I already had that decided to stop working with the new mac update because the developers created it that way.. If a new os update causes an existing version of a program to not respond well, then the creators should put out an update, not throw out the "Oh, I'm sorry, it doesn't work with the new update. You have to buy an upgrade"
Justin Wunderlich Sorry you don't like our business model. Our prices are fair and the developers get paid for their work. Our software is intricately depended on the OS so as Apple make changes we must. Your audio editing program has no such deep dependency short of any ties to AVFoundation/CoreAudio. Old versions of ScreenFlow work on the OSs they were developed for. CraigS I have no problem with developers getting paid for their work. Not at all. Everyone should. But I do have a problem with taking advantage of customers as though we are not ALSO hard working people..
TeleStream wants to charge for a new upgrade that took 2-3 months to "fix bugs" in? Sure. No problem! TeleStream wants to release that upgrade and then corrupt the application 3 versions prior to it making it completely unusable for the people that already purchased it? Yeah, I have a problem with that. As would any logical person. That's why cell phone companies get so much flack and lawsuits filed against them for this same practice, and I'm pretty sure it's an illegal practice in the US..
Is it really so difficult to make ALL versions of ScreenFlow compatible with every mac update? Is it so difficult to go back and readjust the code or whatever inside the program so they work with Mac OS Sierra/High Sierra/Mojave and then release an update for older versions of the program? Idk..I don't think so. I'm not a developer, but I don't think it is that difficult. To me, it just seems like TeleStream pumps out a product, heavily promotes it, and then when a new mac update happens they cater to that update with a new PAID upgrade and give up on the older versions that many of us have already paid for. I don't run 1,000 different programs on my computer, but ScreenFlow is the only one that I've had to pay to upgrade. Screenflow = $140 roughly new. Mac Laptop = Free upgrades. TeleStream wants to release that upgrade and then corrupt the application 3 versions prior to it making it completely unusable for the people that already purchased it? Nothing like that has occurred so I don't know what you're referring to. We can't corrupt previously purchased applications especially if we haven't done any updates to i. No. I have applications that require paid upgrades to maintain OS compatibility. My option is to not upgrade the OS or pay for the application upgrade. I have several applications that require that. We often provide an update for the previously released version for OS compatibility but we can't guarantee that depending on the changes necessary. ScreenFlow 7 has a free update for Mojave compatibility even while ScreenFlow 8 was available. CraigS Fair enough. Maybe corrupt was the wrong word, but I think you know what I meant. "To make older versions obsolete and unusable with newer mac OS updates"
Well, personally, I don't know anyone that has to pay for upgrades for their programs from all the creators I have spoken with. Also, not once have I been given the option to update my ScreenFlow version to one that is compatible with a recent mac OS update. I've only been given the option to "Pay" or "Don't use ScreenFlow anymore"
"ScreenFlow 7 has a free update for Mojave compatibility even while ScreenFlow 8 was available." Really? I don't see one. I have ScreenFlow 7.3.1 - which I paid to upgrade to before Mojave came out. I updated my mac to Mojave roughly 1-2 weeks ago. I open ScreenFlow, click "Check for Updates" and this is what pops up. SO...will my ScreenFlow 7.3.1 also stop working in a few weeks because I recently updated to Mojave? Justin Wunderlich Our built-in updater points to the new version. The updates for 7 are on our site though. It's the linked page under Previous Versions at the top. We often update the previous version for OS compatibility when possible. We post the notice for the previous version here in the forum.